The Force Award is given to a Team NRGY Member who personifies the Mission of Team NRGY and fosters a spirit of camaraderie among teammates with selfless and indispensable support. This year’s award goes to Payton MacDonald for living the Team NRGY Mission Statement while fostering a spirit of camaraderie among teammates with selfless and indispensable support. The Team NRGY Mission is to provide a place open to everyone who is interested in participating in multisport activities, promoting healthy lifestyles, educating others, celebrating the achievements of others and fostering fellowship and healthy competition.Payton came to Team NRGY one might call a true rookie interested in participating in multisport. He had completed a sprint triathlon on a beach cruiser but was ready for more. Armed with a new bike from the Bikery and an infectious “No one can tell me no” attitude Payton spent countless hours learning in the pool, riding the roads and lifting weights. Crowie as he loves to be called (yes, Crowie the 2x Reigning Ironman World Champion) is always a smiling face. And if you find find him smiling he is flexing. Not only has Payton improved to the top ¼ of those competing through his efforts, but he has also undertaken XTerra Triathlon Racing. 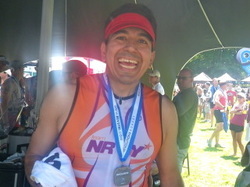 He is the first member in Team NRGY colors to compete in an off-road triathlon. Payton is is receiving the Force award because through his actions he has promoted a healthy lifetsyle, educated those around him, celebrated the achievements of his teammates and all competitors while fostering fellowship and healthy competition. Every time you see Payton he has a word of encouragement and a way to make you laugh. He is able to take the toughest of situations - like when he got a flat during his “A” race at the Steelman Olympic Triathlon - and make someone feel like a million dollars. Despite his difficulties changing a tire in the pouring rain Payton made sure to tell the race director about the kindness of a stranger who stopped and provided a CO2 cartridge so Payton could continue the race. 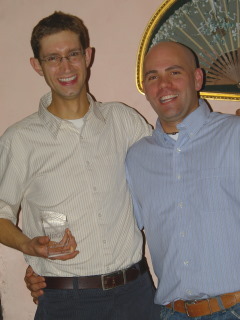 The individual was recognized by the race director at the awards ceremony. Payton wrote in his race report “ From now on I will always carry three CO2 cartridges. One for me, and at least one or two for someone else who might need it.” Instead of being frustrated Payton turned a flat tire in the pouring rain into the opportunity to educate those around him, celebrate the achievements (and kindness) of others and promote healthy competition. When Payton is not training for his next event or encouraging his teammates, he is a husband, father, professor at William Patterson and a percussionist with the world renowned contemporary musical group Alarm Will Sound. A true Renaissance Man. He has even started a blog appropriately entitled – “Soul of Triathlon: exploring the emotional, mental and spiritual aspects of triathlon.” His energies are boundless. His energies are infectious. Team NRGY and those around him are better for having crossed paths with him. Payton, you embody the Team NRGY Mission. I am proud to present you the with the 1st Team NRGY Force Award. Thank you for all your efforts and we look forward to continuing to help you attain your personal goals in the upcoming season. Imagine that you're in the middle of a taper run and a pack of coyotes approaches you. Then imagine that a few days later you meet up with another coyote while driving. And on a bike ride you encounter a large black bear. What kind of person would attract some of the world's most elegant animals, some of the world's most ferocious hunters?Now imagine how difficult it must be to to balance life as the Senior Vice President of Human Resources at Hermes, a major company that specializes in luxury apparal and accessories, commuting in and out of NYC every day, while successfully raising two children. Think for a moment about how difficult it must be to keep that schedule while training for a 70.3. The endless hours in the pool, the bike, running, stretching, strength training, most of them at 5:00 a.m. or late at night; sacrifices that paid off with successful races at Mooseman 70.3 and Silverman 70.3. Silverman! A tough course, with some tough hills. What kind of person would sign up for a course with some tough hills if that person didn't like hills that much? Still, when her coach encouraged her to work on her climbing, she swallowed her pride and attacked Francisco two times in a row. And Mooseman 2010! An epic race! Torrential downpour all day, lightning, delayed start, cold, wet, uncomfortable racing conditions. But she preservered, even though mechanicals and muscle cramps, tears in her eyes from pain and frustration, still finishing the race in time. This person is a leader. Organizing runs, driving folks to and from Split Rock reservoir at 5:00 a.m. (before putting in a 10-hour day at work in NYC, before the commute), organizing trainer sessions at her home in the dead of winter. She's been lost on many bike rides, but still leads the pack in enthusiasm and positive energy, applauding the efforts of others. She asks questions, listens to the answers, and makes the changes she needs to make to be a better triathlete. And she's a human being; warm, funny, and with an extensive purse collection. 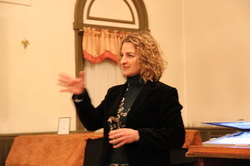 This person is Barbra Katz, and she is the 2010 Team NRGY Force Award winner. The Force Award is given to a Team NRGY Member who personifies the Mission of Team NRGY and fosters a spirit of camaraderie among teammates with selfless and indispensable support. We are honored to have her on the team, and it is with much respect that I ask her to come forward to claim her award. I've had the great pleasure to get to know a lot of folks in Team NRGY and I really enjoy the diversity of talent and personalities that we have. One of those folks, is Carlos Jimenez. Many times I've come home from rides and told my wife Jessica that the ride was great, especially because Carlos was there. I've never heard him complain about any thing and he always has a giant smile on his face.He works hard. He's typically up by 4:30 and puts in a few hours of training before helping get the kids to school and then commuting into the city where he works as a financial expert for NBC. (Which means he gets to watch TV at work . . .) Then a commute home, more time as a father and husband and finally to bed. It's a schedule most of us know well, but it wasn't always so for Carlos. Not so long ago he was 50 pounds heavier and having health problems. Some colleagues at work recommended he try a 5K and soon enough he was doing more and more. He improved his eating habits and began working out and the pounds melted off. Now he's a sub four-hour marathoner and a 70.3 finisher many times over. But it's his sportsmanship that really defines him and is the reason he is the Team NRGY 2011 Force Award winner. Earlier this year he was cruising through the bike portion of a 70.3 and he witnessed a gnarly crash. He stopped and helped the person, adding at least five minutes to his time. If he hadn't he would have been able to claim his first sub-six hour 70.3, but sportsmanship is more important to Carlos than time. He keeps his ego in check and understands balance. I look forward to many more years in his company. That's just one example; there are many more. We are lucky to have him on the team and I'm proud to present him with this award. This year’s recipient is a founding member of Team NRGY whom I have had the pleasure of getting to know over the last four years. This year’s award goes to Jessica Hagenbuch who embodies the Mission of Team NRGY while fostering a spirit of camaraderie among us. 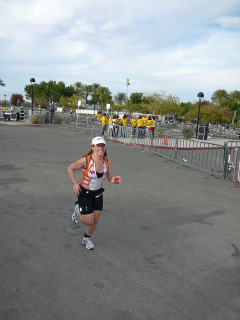 Specifically, Jessica exemplifies the Mission – she is passionate, she is a good friend, she is a supportive training buddy, she is a competitive racer and she has fun.We would be here all night if you allowed me to offer every instance when Jessica acted to support us while pursuing her multisport goals. Jessica has personally been a training buddy over the last few months making sure I got back on track. Jessica is always waiting for me to come out the door in the dark hours of the morning. She will tell me I help her, but I know in reality she is making sure someone else is getting out the door. If making sure I get out the door is not enough – she spent the spring and summer training for Ironman Lake Placid with Scott Lewis, Stephen Grossman, Rose and a host of others. I know time and again, Jessica led rides, offered course advice and sometimes sacrificed her training to help others. These are the little things that often go unnoticed. Thank you Jessica. Jessica also has a tremendous sense of humor. She is one of the few people on the team that can match wits with Stephen Grossman and Scott Lewis. Her ability to keep the long arduous training hours light is a gift. One we are lucky that she shares this gift with us. Jessica is competitive. 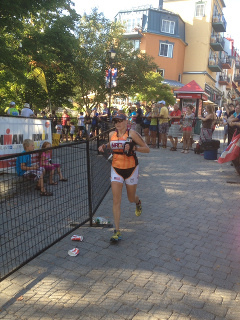 She is one of the few people I know who has put down a negative spilt marathon in an Ironman. Jessica ran Boston this past year in sweltering heat and stayed the plan and continued to “move up the standings” as others withered in the heat. Her determination and dedication is something we can all learn from. Jessica is also well known on the Team for baking ability. I am sure we have all benefited from her talents as a pastry chef. When Jessica is not training or baking she is probably lending a hand as a graphic designer. Less than 36 hours before Ironman, Jessica opened her condo in Lake Placid to host a gathering for all of Team NRGY when it might have been easier to put her feet up and rest. No matter where any of us turn, Jessica is probably there. Jessica is a rare individual who motivates and supports those around her before tending to her need. Jessica has enriched our lives. I am honored to present the 4th Team NRGY Force Award to Jessica Hagenbuch. The Force Award is given to a Team NRGY Member who personifies the Mission of Team NRGY and fosters a spirit of camaraderie among teammates with selfless and indispensable support. These individuals are the one’s who are always there for us. The know just how to bring out the best in us. The 2013 Force Award winner, Stephen Grossman, represents the individual we would all like to have a teammate.Stephen is the General Agent of MassMutual Metro New York, a demanding job that would leave many of us little time to workout let alone provide support to teammates. His days typically start at 4:30am to get his training sessions completed. And he does not miss a second of his training. Then a trip to his office in NYC - for a day, which according to Stephen is filled with meetings. Although, I think he spends half his day eating Peanut M&M’s and staring at pictures of himself racing. All kidding aside, those photos must be magic providing Stephen with the vision and verse to encourage us all. Stephen embodies the Team NRGY mission - Team NRGY is an ever-growing community of passionate multi-sport athletes of all abilities who are good friends, supportive training buddies and competitive racers who share a common goal – to have fun. 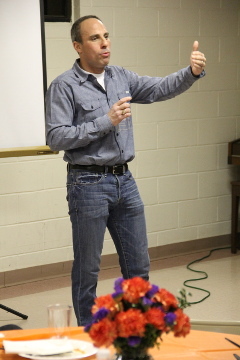 Stephen is a leader on Team NRGY - whose enthusiasm is contagious. Through his actions he has celebrated the achievements of his teammates and educated us all. His words are but one example. I am privileged with the honor to present the 2013 Force Award to Stephen Grossman. The past winners of the Force Award are the individuals who are always there for you with a word of encouragement, a spare tube or a hug. Tonight is an anniversary for this year’s winner – she came to Team NRGY one year ago. Its not like Lori Carlo came off the street but she took a leap of faith, signed up for Ironman Lake Placid, joined our family, came to dinner and has played an instrumental role in many team events. One might that training for an Ironman would take all of your time and focus. Admittedly Ironman training is demanding. Yet, Lori always seems to find a way to lend a hand. Lori organized the Princeton tailgate, the Princeton Pre-Race Dinner, the Princeton Training Ride Tailgate, and was instrumental in making tonight’s awards dinner a reality. Lori logs the hours behind the scenes making it possible for us all to succeed. Lori is the Director of Human Resources at Universal McCann (UM). Although a short commute from Hoboken, Lori is up at the crack of dawn to complete her training and log it.